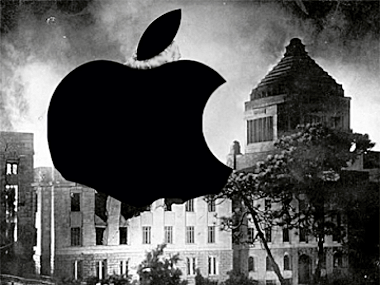 Apple’s latest quarter was a monster, all right. Reporting first-quarter earnings after the bell on Tuesday, Apple rolled out the big numbers once again, its strong financials fueled by record iPhone and iPad sales. The company posted a profit of $13.06 billion on revenue of $46 billion. Earnings per share were $13.87, far more than the $10.08 per share analysts had been expecting. Apple said it sold 37.04 million iPhones for the quarter, up more than 128 percent from the year prior; 15.43 million iPads, up 111 percent (so much for the Kindle Fire …); 5.2 million Macs, up 26 percent; and nearly 15.4 million iPods, down 21 percent. Big numbers — all of them. And all but one trounced estimates. Analysts had expected Apple to report first-quarter earnings of $10.08 a share on revenue of about $38.8 billion. And, on average, they had called for iPhone shipments of nearly 30 million, iPad shipments of about 14 million and Mac shipments of around five million. Apple’s guidance for the second quarter of fiscal 2012, as per usual, is comically low: Expected revenue of $32.5 billion and earnings per diluted share of $8.50. Apple shares, which had slipped more than 1.6 percent to $420.31 in advance of the company’s earnings announcement, are now headed back upward in after-hours trading. Quick observations before the call: Apple now has $97 billion in cash, short- and long-term securities on hand. Apple’s profits exceeded Google’s entire revenue — $10.6 billion. Q1 2012 brought with it all-time highs for quarterly iPhone, iPad and Mac sales. Customers have downloaded more than 100 million apps from the Mac App Store in its first year. iPod still claims more than a 70 percent share of the MP3 market. The iTunes store generated $1.7 billion in revenue. $120 million in apps and music sold on Dec. 25 alone. Almost all of the Fortune 500 support the iPhone. Many are developing mission critical iPhone apps. … with all segments of the market. Unprecedented adoption in Fortune 500 and education. More than 600,000 copies of iBooks Author have been downloaded so far. 85 million iCloud customers so far. By the end of this month, developers will have earned $4 billion cumulatively from App Store sales. $6.1 billion in revenue from Apple retail stores. Each store generated an average of $17.1 million in revenue last quarter. That’s an increase of 43 percent from the year prior. Flooding in Thailand has forced Apple to pay more for hard drives. There wasn’t a material supply or cost impact on any product lines in the December quarter, but there will likely be a cost increase in March. Cook: We’re really happy with the 15.4 million iPads we were able to sell. This is consistent with our long-term belief that this is a huge opportunity for Apple over time. And, as I’ve said before, there will come a day that the tablet market is larger than the PC market. IDC’s recent data shows that tablet sales exceeded desktop PC sales in the U.S. There is significant momentum in this space. In terms of competitiveness, the iPad ecosystem is in a class by itself. We now have 70,000 apps. … I think people really want to do multiple things with their tablets, so we don’t see these limited-function tablets and e-readers as being in the same category as iPad. We don’t think people who want an iPad will settle for a limited-function device. Peter Oppenheimer on Apple’s $97 billion in cash, and what the company might do with it: “We know it’s growing. We’re talking about it. … When we have something to announce, we’ll announce it.” He really doesn’t want to answer questions about this. Cook on Apple TV and a possible Apple Television: Apple TV is doing extremely well; we just sold a record 104 million units. But we still classify this area as a hobby. We think it’s a fantastic product, and we continue to pull strings and see where we can take it. Another question about that $97 billion. Did I mention that Oppenheimer really doesn’t want to answer questions about Apple’s cash? Cook: We’re thrilled with iCloud. The response from our customers has been incredible. We’ve signed up 80 million customers in three months. It’s not a product, it’s a strategy for the next decade. Question about Anobit acquisition, but Oppenheimer dodges. Cook on the iPhone in India and Russia: We’re selling in Russia through reseller and carrier partners, and we’re doing the same thing in India. … The next country on our list is Brazil — there’s a huge opportunity there. But I don’t envision Apple Retail going there in the near term. Cook: When I looked at the data, particularly in the U.S., after Amazon launched the Kindle Fire, there wasn’t an obvious effect, plus or minus. Cook on Android versus iPhone: I wouldn’t compare it to Mac and Windows. The Mac has outgrown the market 20 quarters in a row, but still has single-digit market share. We’ve sold over 315 million iOS devices, and over 62 million were sold in the last quarter alone. I don’t have comparable numbers for Android, as I haven’t found a way to get very crisp quarterly reporting for Android like we do, that is transparent and reliable. … Nielsen shows iPhone at 45 percent and Android at 47; comScore shows iPhone at 42 and Android at 41. It’s a very close race. I wouldn’t say this is a two-horse race. There’s a horse in Redmond that always suits up and runs. There are always other players. We’ll just want to focus on making great products. We ignore the number of horses on the track — we just want to be the one in the lead.